All of the products shown in this shop are produced and sold directly by Biker-Gifts. By clicking the picture you will be re-directed to their respective website to view the product and hopefully place an order. The ideal gift to save the page in your Joey Dunlop book, this NEW bookmark is approved by the family. Size: 200mm x 55mm laminated, complete with contracting yellow ribbon. 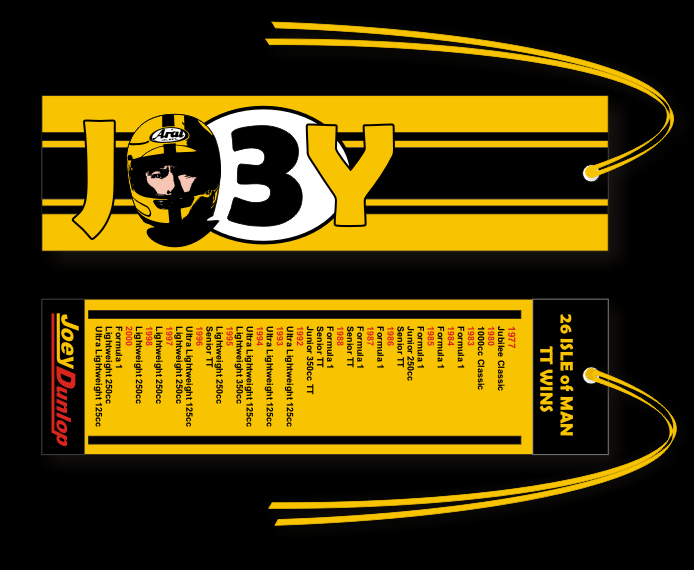 The rear of the bookmark lists all of Joey's 26 Isle of Man TT wins. We cannot and do not accept any responsibility or liability for any losses you may suffer as a result of entering into any transaction with any third party including the branded retailers on the site.